It is less known that the, always controversial, Astor Piazzolla remarked that “La Cumparsita is the worst of all tangos”… and yet, recorded it himself four times with his orchestra. But what is even less known, is that the violin in the very first 1917 Firpo’s recording, as well as in the record breaking 1943 D’Arienzo recording… and at least four more recordings was played by the same man, Cayetano Puglisi. … One of the tricks D’Arienzo used throughout his long career was a short violin solo on the lowest string. He did not invent this trick. It was well-known since the Guardia Vieja time. And it was used by many orquestas. But it was D’Arienzo who used that short solo in each and every tango he recorded, and, by which, we can unmistakably identify his orchestra. What is so special about it? The violin has a rather high pitch. But, when played on its lowest string, it is quite close to the human’s voice. And when the violin is played by Cayetano Puglisi, this voice speaks directly to your soul. Just one phrase, soul to soul. The owner of this magical voice, Cayetano Puglisi was born in Italy. He arrived in Buenos Aires in 1909, and in 1916 joined Firpo’s orchestra. Firpo himself taught young Puglisi – an accomplished classical violin player – the tricks of tango violin. In 1917, his first encounter with La Cumparsita happened in Montevideo, and the first recording in Buenos Aires followed. From 1926 to 1928 he played in the Pedro Maffia sexteto, together with Osvaldo Pugliese and Elviro Vardano, and in 1928 formed his own sexteto. Of course, with his own sexteto he also recorded La Cumparsita. From 1928 to 1940 he regularly took part in the recording sessions of Francisco Canaro, and, among many other tangos, he recorded La Cumparsita again. Are you still counting? In 1940 Juan D’Arienzo lost all of his orquesta to his, now former, piano player, Juan Polito. In less than three months D’Arienzo assembled a new one, convincing no one else but Cayetano Puglisi to play the first violin. Since then, Cayetano Puglisi stayed with D’Arienzo until his death in 1968. 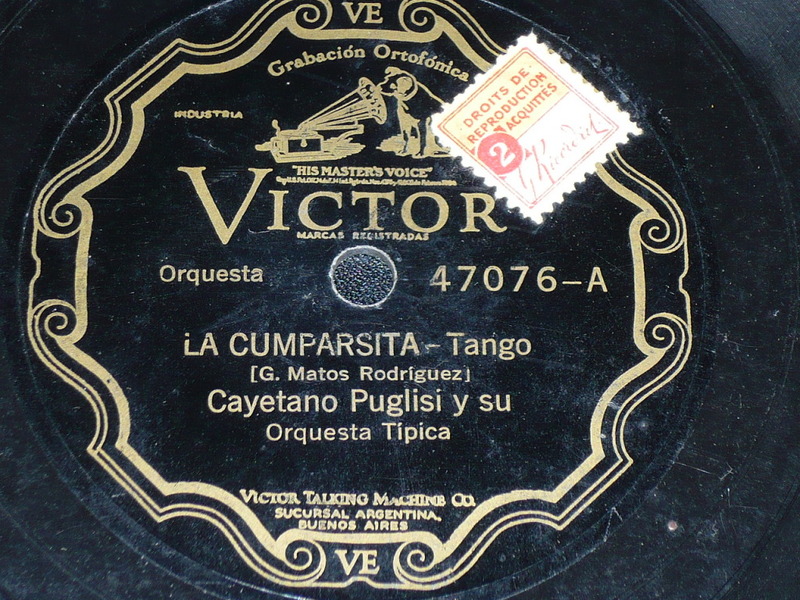 Three more recordings of “La Cumparsita” followed, including the famous 1963 recording from the “Tango for Export” series, as well as hundreds of other tracks. If you read any biographical account of Cayetano Puglisi, you will undoubtedly meet with a sentiment that “a musician of such calibre was reduced to playing simple solos”. Having studied violin for quite a few years myself, I completely disagree. Listen to Puglisi’s violin, and watch him, on the live recording below. Do you hear what I hear? Is there any shadow of dissatisfaction in those so called “simple solos”? Or is it indeed the greatest achievement of one of the best violinists of the Golden Age? Hi! I’d like to point out another track where you can clearly hear Puglisi’s skill. It is milonga Sali de perdedor from the year 1940. The first Puglisi’s solo intervention comes at 0:35. And returns during song couple times again. I you’ll be as amused as I was when listening it for the very first time. Thank you, it is indeed unusual piece – Puglisi played in this manner in the 50s, when Salamanca became an arranger instead of Varela, (such as Yapeyu, etc) but this milonga was recorded in 1940 – just in the dawn of the new D’Arienzo orquesta.